Given that you need at least one other player in order to play, racket sports do not represent the same lonely path to greater fitness and health as, for example, running and cycling can do. However, it is almost inevitable that you will begin to tire of your regular playing partner or partners. They may have represented a challenge when you began but as you get better and better, rather than help they will hinder your progress because you do not possess an opponent to push you to the limit and help you improve still further. Even players of similar ability will eventually become jaded with each other as they come to know their opponent's game almost as well as their own. Of course, there's always the possibility that the odd disagreement over a line call has soured relations. Yes, it is only a game, but take the competitiveness away and you don't have a contest. When the time comes to look for new challenges, many players choose the option of joining a club. There will be a fee involved, sometimes £50, in other places several hundred pounds, but bear in mind there are likely to be discounts for senior citizens and students, as well as families. The financial outlay may seem steep, but look what you get for your money. Principally, the facilities are likely to be superior to any municipal court. 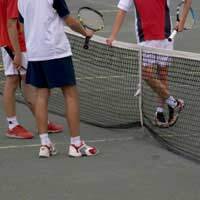 Tennis players may be able to choose from a number of surfaces that will bring a new dimension to their development. It is likely also that there will be at least a couple of courts with floodlit facilities that can offer practice time outside office hours for players during the shorter daylight time of the winter months. Of course, there will be plenty more opponents to play against, including those of a similar ability and age group so that you can get a better idea of your progress. These new opponents will also provide new stimulation off court. Surrounded by fellow lovers of the game will mean you can broaden your circle of companions and enjoy chats about technique that may leave non-playing friends a little jaded. Clubs can also be a very useful source of information both on training camps and city or countywide tournaments where you can really begin to test yourself. There may be a club shop or scheme that offers discount prices on rackets, clothing and shoes, too.Finding a club can be as easy as opening a copy of your local Yellow Pages or phone directory. Or visit the internet site of the governing body for tennis, badminton or squash in your own country as they are likely to incorporate a search facility that provides contact details for the club nearest you. Before parting with your membership fee, inspect the facilities and talk to the organisers so that you get a feel for the place. Remember that you'll be spending a fair amount of your leisure time at the club, so you want to ensure it has everything you need and that the atmosphere is friendly. Should the club offer split season membership i.e. you only join for the summer or winter months rather than the whole year, this may provide an economical way to see whether the club has all you need to commit yourself to a full 12 months' membership at a later date.